If it’s winter where you are at, then you’re probably looking for a good book to read. 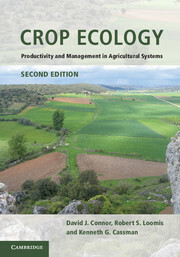 I have one suggestion that you might consider – Crop Ecology: Productivity and Management in Agricultural Systems by David J. Connor, Robert S. Loomis, and Kenneth G. Cassman. This is the 2nd edition of this very good book published by the Cambridge University Press.